The Western United States is naturally dusty, right? With the exception of some dry lake beds and parts of very hot deserts this is not true. 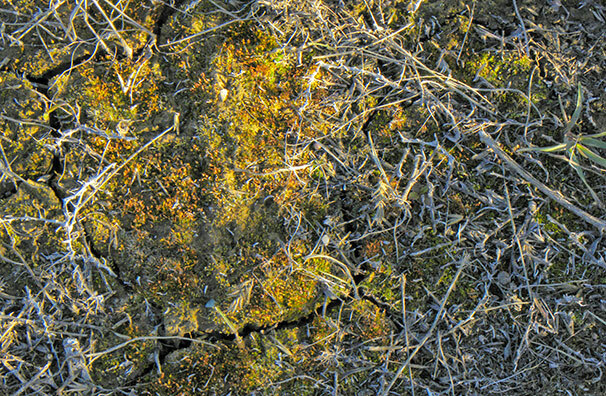 Soil is held in place from the wind by vegetation and rock. Anything that reduces the ground cover to dirt will result in it blowing away in the wind. Even deserts where there appear to be wide barren spaces between plants are not naturally bare. Desert soil is naturally covered by a microbiotic crust. This holds the dirt down except in the strongest winds. Unfortunately, hooves and wheels destroy this crust. I took the photo above in early April near Pocatello, Idaho, along an old road bed. The road had been closed for 3 years and the area had never been grazed. The road used to produce big clouds of dust. Now that it has largely filled in, it doesn’t. Well this is certainly even more evidence of the critical role of microbiotic crusts, and the devastating effects of livestock trampling on crusts and soils. Instead of Salazar running around in his cowboy hat promoting reckless renewable energy everywhere on public lands to save polar bears – a real Secretary of the Interior would move as rapidly as possible to get the cows and sheep off public lands. Hundreds of millions of acres de-stabilized by the farce of welfare ranching. Salazar should also be working to limit ORV use on public lands. There was a soil scientist, Howard Wilshire, who stated the soil crust destroyed by ORV activity would not repair itself in a thousand years.While the crusts will show signs of repair after 10 years of being idle, they are, by no means, recovered. ORV use, in my opinion, caused far more damage than is warranted. Much of the damage cannot be quantified in dollars and cents. If it could, the Forest Service and the BLM would be justified in charging users for the damage they cause. That would be an end to the problem, because most users would not be able to afford the ticket to play.